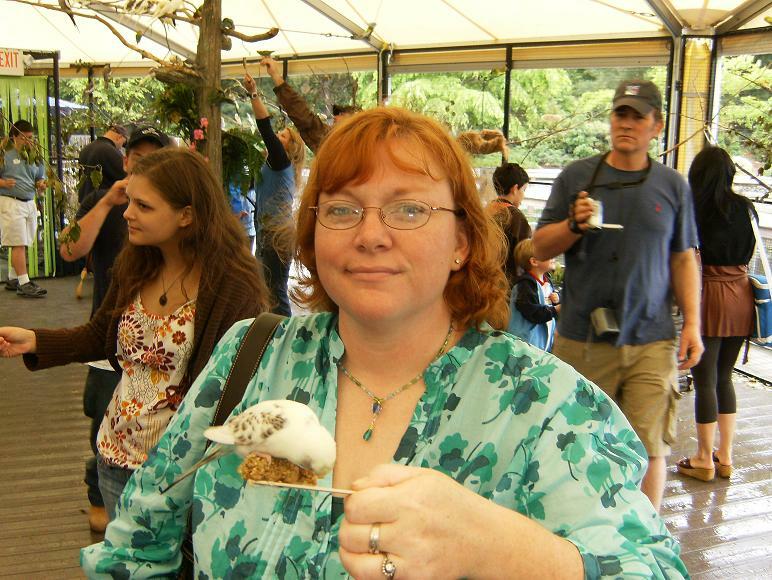 Hello, and thank you for visiting my website!I truly appreciate it.My name is Jen and I am a 41-year-old wife, mother and Janeite. I write Austen-inspired fiction for my own entertainment as well as the amusement of other fans of Ms. Austen. I read L.M. Montgomery’s tales of the red-headed orphan Anne and I instantly fell in love with her story. Anne Shirley made mistakes, was far from perfect, had a temper and was allowed to be smart. Anne (with an e, thank you!) has romantic ideals but doesn’t believe they could possibly come true for her. Anne’s Gilbert Blythe was without a doubt my first so-called literary crush. And then I met a tall, dark, handsome man named Fitzwilliam Darcy. 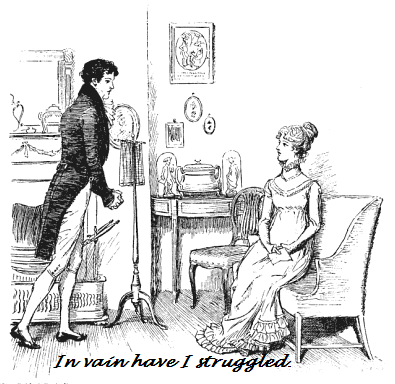 I was thirteen years old when I first read Jane Austen’s masterwork Pride and Prejudice. That year I read many other ‘classics’: The Count of Monte Cristo, Romeo and Juliet, The Three Muskateers and a few others. The heroes Dantes, Romeo, D’Artagnen and the rest never even stood a chance. My heart was already engaged to the proud, aloof man with the passionate heart from Derbyshire. I freely, to my husband’s chagrin, admit a ‘movie’ crush on Colin Firth too. I first saw him in Valmont and then a few other things (A Month in the Country, Secret Garden and Tumbledown) long before I ever saw him don those fawn breeches and lawn shirt as Mr. Darcy. Now sometimes books are illustrated and that can often help fill in blanks of your imagination. The first edition of Pride and Prejudice that I owned had been illustrated by Hugh Thomson. Now the Thomson illustrations are greatly similar to the more common Brock ones, but there are a few that particularly stand out in my mind and helped define Mr. Darcy’s appearance for me. They are illustations of scenes at Hunsford- the first when he finds Elizabeth alone (“What is fifty miles of good road?”) and then of course, the first proposal. Though Mr. Darcy infuriates her, the passion in his address in unmistakable. The Thomson illustration matched closely with Andrew Davies (much maligned for taking liberties) production of Pride and Prejudice. 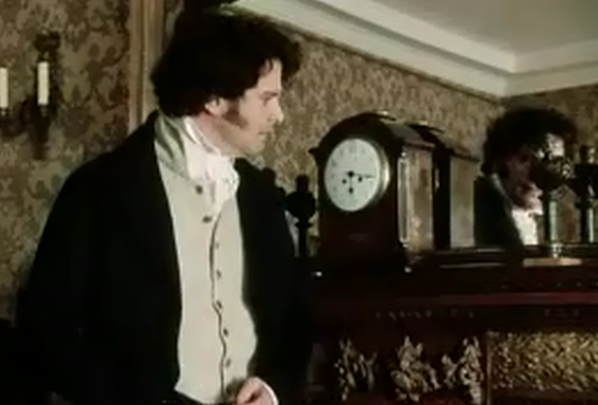 I think when Colin stood leaning heavily on the mantlepeice, he was forever sealed in my mind as Mr. Darcy. Anyways… I find I am digressing. To say that I enjoy the novel Pride and Prejudice would be an understatement. Like many fine people I’ve ‘met’ over the last several years I am rather rabid in my obsession. We call the book scene-by-scene like some people would call a sports competition play-by-play. I imagine the Meryton Assembly would be called something like this: And here comes the players from Netherfield onto the court. Starting strong with Bingley making a move on Jane…but oh no! Darcy drops the ball with an insult to Elizabeth. It’s too true! When you’ve repeatedly read the novel and dissected it as often as someone in the JAFF community has, you know all the plays… Meryton Assembly, Lucas Lodge, Jane’s illness, Collins’ arrival, Wickham in Meryton, Netherfield Ball, Bingley & Co. hie back to London, Christmas, Jane in London, Lizzy goes to Kent, Rosings, Big-mouth Colonel, Hunsford, Letter, Lydia leaves, Pemberley, Lambton, Super-Darcy in London, Newlyweds at Longbourn, Darcy returns #1, Jane/Bing engaged, Lady C, Darcy returns #2, enagaged (finally!) and then happy endings! We all know the playbook… the fun lies in how we re-arrange the plays to change the game! ….and that is why I write the stories I do! So sorry about your computer woes! I had my own hard drive crash a week and a half ago and it has been a rough couple weeks. Hope you have a super vacation and can’t wait for more OoR when you return home!